Intra-aortic balloon counterpulsation is a method of temporary mechanical circulatory support that attempts to create more favorable balance of myocardial oxygen supply and demand by using the concepts of systolic unloading and diastolic augmentation. As a consequence, cardiac output, ejection fraction, and coronary perfusion are increased, with a concomitant decrease in left ventricular (LV) wall stress, systemic resistance to LV ejection, and pulmonary capillary wedge pressure. The following review discusses the hemodynamic, clinical, and technical aspects of this important modality for hemodynamic support. The principle of aortic counterpulsation was originally described by Dr. Adrian Kantrowitz in 1959 using a dog model in which the hemidiaphragm was wrapped around the thoracic aorta, which, by electrical stimulation of the phrenic nerve, was made to contract during diastole. Altering the pressure characteristics of the cardiac cycle by augmenting diastolic pressure was postulated to improve coronary perfusion and take over as much as 25% of the pumping burden of the natural heart. The modern intra-aortic counterpulsation device, which consists of a balloon mounted on a flexible catheter, was described by Moulopoulos et al at the Cleveland Clinic in 1962. The original description was of a latex tube tied around a polyethylene catheter with side holes. Carbon dioxide was used to inflate the balloon regulated via a 3-way solenoid valve. Balloon inflation occurred for a predetermined duration and was timed using the R wave on the electrocardiogram. The IABP improves many of the hemodynamic perturbations of circulatory failure and cardiogenic shock. Therefore, understanding the pathophysiology of this dramatic manifestation of heart failure is important. Cardiogenic shock is characterized by end-organ tissue hypoperfusion, which initiates a series of counter-regulatory mechanisms. The classic understanding of the interplay between the underlying pathophysiology and counter-regulatory mechanisms is that of a downward spiral in which compensatory mechanisms such as peripheral vasoconstriction, tachycardia, and neurohormonal regulatory activation contribute to further worsening of left ventricular failure (see image below). Cardiogenic shock is the most common cause of death from acute myocardial infarction. According to data from the SHOCK registry, the mortality from cardiogenic shock complicating acute myocardial infarction is 50-80%. In addition, data indicate that anterior myocardial infarction is the most common territory leading to cardiogenic shock. In the SHOCK registry, 55% of infarctions were anterior. Cardiogenic shock is diagnosed at the bedside by observing the clinical signs of end-organ hypoperfusion such as altered mental status, cool and mottled extremities, and oliguria. The diagnosis is confirmed by demonstrating hemodynamic criteria consistent with myocardial dysfunction. Mechanical complications of acute myocardial infarction can precipitate cardiogenic shock or contribute to preexisting cardiogenic shock. These include acute mitral regurgitation, postinfarction ventricular septal defect, and left ventricular free wall rupture. For more information, see Medscape Drugs & Diseases article Complications of Myocardial Infarction. Catecholamine vasopressors to treat hypotension in the setting of cardiogenic shock should be used judiciously to maintain coronary perfusion pressure but also minimize additional myocardial oxygen demand through increasing afterload and genesis of dysrhythmias. The above highlights of cardiogenic shock pathophysiology set the stage for the following discussion of counterpulsation hemodynamics. The intra-aortic balloon, by inflating during diastole, displaces blood volume from the thoracic aorta. In systole, as the balloon rapidly deflates, this creates a dead space, effectively reducing afterload for myocardial ejection and improving forward flow from the left ventricle. The net effect is to decrease systolic aortic pressure by as much as 20% and increase diastolic pressure. In a multicenter trial of counterpulsation in cardiogenic shock, a mean 30 mm Hg increase in diastolic pressure was observed with no significant change in heart rate. The IABP pressure tracing in the image below shows the systemic hemodynamic effects of counterpulsation in a 2:1 configuration, whereby every other beat is assisted by balloon inflation. 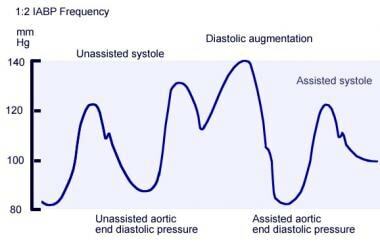 Notice the increase in diastolic pressure, the decrease in peak systolic pressure on the postassisted beat, and the decrease in aortic end-diastolic pressure on the assisted beat. Annotated arterial pressure tracing obtained from intra-aortic balloon pump set to a 2:1 ratio. Notice the increase in diastolic pressure, the decrease in peak systolic pressure on the postassisted beat, and the decrease in aortic end-diastolic pressure on the assisted beat. The net effect on myocardial mechanics is to decrease myocardial oxygen consumption, increase cardiac output, and lower peak left ventricular wall stress. The magnitude of counterpulsation hemodynamic effect depends on several factors, including the relation of balloon volume to aorta size, heart rate and rhythm, and aortic compliance. In addition, diastolic augmentation is most efficient the closer the balloon is to the aortic valve. To minimize the risk of cerebral embolism, the ideal IABP position in modern practice is 1 or 2 centimeters distal to the origin of the left subclavian artery. In theory, the augmentation of diastolic pressure by counterpulsation should be transmitted to the epicardial coronary circulation, leading to an increase in myocardial perfusion. However, the data suggest that the degree of coronary artery stenosis and the state of coronary autoregulation cause significant variation in response to counterpulsation. Kimura et al, using an anesthetized dog model, showed that diastolic forward flow in the left anterior descending (LAD) increased by 12% during counterpulsation. However, with partial ligation of the left main to create a critical stenosis, the effect of counterpulsation to augment LAD flow was completely abolished. In human subjects, data regarding augmentation of coronary flow by counterpulsation is inconsistent. Transesophageal echocardiography (TEE) Doppler tracings from epicardial vessels obtained in patients with an IABP have shown increased Doppler velocities, suggesting augmented coronary flow. The effect of diastolic augmentation on post-stenotic coronary flow has also been assessed using a Doppler angioplasty guidewire in patients undergoing angioplasty. Kern studied coronary flow in 15 patients with a mean vessel narrowing of 95%. No significant increase in coronary flow augmentation was demonstrated in the post-stenotic segment, but angioplasty restored the effect of counterpulsation to augment coronary flow. Because of the severity of luminal obstruction present in the population studied, the use of a guidewire beyond the stenosis may have adversely affected flow measurements. In addition, conclusions cannot be drawn regarding flow augmentation beyond less severe stenoses, since these were not studied. Takeuchi addressed this issue by comparing 40 patients undergoing counterpulsation for typical indications using transthoracic Doppler echocardiography to measure coronary flow velocity. Analysis of the data stratified by lesion severity showed enhanced distal vessel flow regardless of the degree of stenosis present. 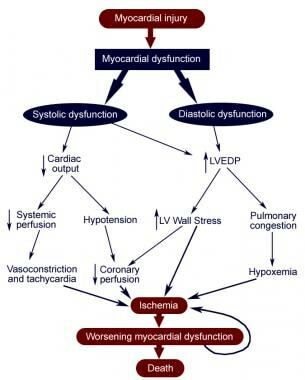 Nonetheless, a major contributor to the relief of ischemia by counterpulsation is via its effect to decrease afterload, left ventricular wall stress, and myocardial oxygen demand. The first image below shows a chest radiograph from a patient with an IABP in place with the major landmarks vital for proper positioning highlighted. The second image shows intra-arterial positioning of an IABP. 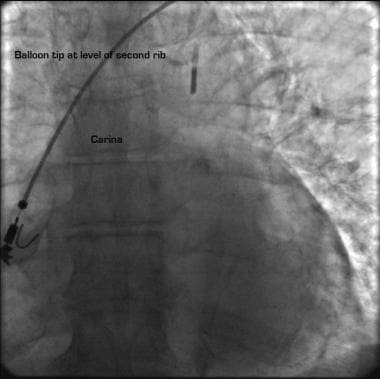 Chest radiograph demonstrating proper positioning of an intra-aortic balloon pump catheter. Major landmarks are annotated on the radiograph. 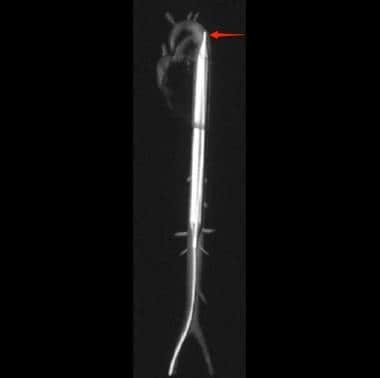 Intra-arterial positioning of an intra-aortic balloon pump (IABP). Used with permission from Radiopaedia.org (http://radiopaedia.org/cases/intra-aortic-balloon-pump-and-icu-lines). The aortic valve functions to prevent the regurgitation of blood from the aorta into the left ventricle during ventricular diastole and to allow the appropriate flow of blood—the cardiac output—from the left ventricle into the aorta during ventricular systole. For more information about the relevant anatomy, see Aortic Valve Anatomy. American College of Cardiology/American Heart Association (ACC/AHA) 2013 guidelines for the management of ST elevation myocardial infarction (STEMI) and European Society of Cardiology (ESC) 2012 guidelines for the management of acute heart failure believe it is reasonable to use IABP therapy in the setting of acute myocardial infarction where cardiogenic shock cannot be quickly reversed with pharmacologic therapy (class IIa/IIb indications, respectively). It is to be used as a temporary stabilizing measure (prior to revascularization if appropriate). Data from the Global Utilization of Streptokinase and Tissue Plasminogen Activator for Occluded Coronary Arteries (GUSTO-1) trial showed lower 1-year mortality in the cohort (68 of 310 subjects with cardiogenic shock) receiving early IABP support (57% vs 67%, P = 0.04). Of note, rates of major bleeding were also higher in the IABP cohort (47% vs 12%, P = 0.0001). Decompensated systolic heart failure as bridge to definitive mechanical support or transplantation: Counterpulsation therapy, owing to its effect to decrease cardiac work, left ventricular end-diastolic volume, and pulmonary capillary wedge pressure, is used as a temporizing measure in extreme LV failure. Current insertion techniques using the axillary artery have also allowed for more prolonged counterpulsation therapy in patients awaiting cardiac transplantation (IIb). The use of preoperative IABP in high-risk patients undergoing revascularization by coronary artery bypass graft surgery has been shown to reduce operative mortality in patients with high-risk characteristics including symptomatic heart failure and medically refractory angina. [19, 20, 21, 22] The use of IABP for noncardiac surgery in patients with high-risk cardiac disease has been based on case reports and anecdotal data; no clinical trials have examined the benefit of counterpulsation in this setting. The routine use of IABP is septic patients is not recommended, nor has it been shown to offer any consistent mortality advantages in various animal or human studies. The 2012 Surviving Sepsis Campaign guidelines do not mention IABP in current management options. Selection of balloon size is determined by the height of the patient. For patients shorter than 5 feet, a 25 cm3 balloon is recommended. A 34 cm3 balloon is available for patients 5 feet to 5 ft 4 inches tall. The most common balloon size is 40 cm3 for patients 5 ft 4 inches to 6 feet tall. A 50 cm3 balloon is available for patients taller than 6 feet. The Table below summarizes the counterpulsation balloon catheters currently available on the market. In modern usage, intra-aortic balloon counterpulsation is performed with a polyethylene balloon mounted on a flexible catheter positioned 1-2 cm below the origin of the left subclavian. The shaft of the balloon catheter contains 2 lumens: one allows for gas exchange from console to balloon; the second is used for catheter delivery over a guidewire and for monitoring of central aortic pressure after installation. Balloon inflation is performed using helium, which, owing to its low density, can be rapidly exchanged through the tubing and catheter to allow for rapid balloon inflation and deflation during the cardiac cycle. Insertion is generally performed via either one of the femoral arteries using a standard percutaneous Seldinger technique over a 0.030-inch guidewire provided with the balloon catheter. McBride et al described the insertion of an intra-aortic balloon pump (IABP) catheter via the axillary artery to allow for more patient mobility. This is performed via a cutdown, often using a 6-12 mm GoreTex or Dacron sleeve sewn onto the axillary artery to facilitate introduction of the device. An IABP device can also be inserted via the brachial artery or subclavian artery or, during open-heart surgery, directly into the ascending or thoracic aorta. Following installation, the balloon catheter is connected to the console and the system is purged with helium. 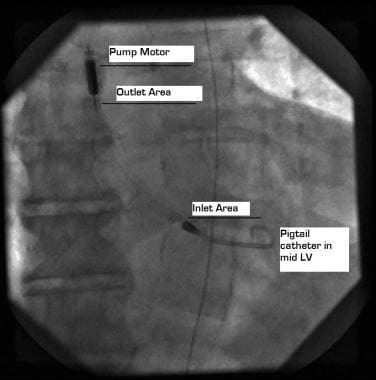 The central lumen of the catheter is connected to pressure tubing and a pressure transducer to allow for monitoring of central aortic pressure. Heparin should be given as a bolus and continuous infusion to maintain a partial thromboplastin time (PTT) of 60-80 seconds or an activated clotting time (ACT) of 1.5-2.0 times normal. Early balloon inflation (see image below) occurs prior to aortic valve closure. The net hemodynamic effect is an increase in left ventricular end-diastolic pressure (LVEDP), volume (LVEDV), and wall stress, resulting in increased myocardial oxygen demand. This is rectified by setting balloon inflation to occur immediately after the dicrotic notch. Intra-aortic balloon pressure tracing with 1:2 counterpulsation ratio depicting the timing error of early balloon inflation. Late balloon inflation (see image below) occurs long after closure of aortic valve, leading to inefficient diastolic pressure augmentation and diminished coronary perfusion. This is rectified by setting balloon inflation to immediately after the dicrotic notch. Intra-aortic balloon pressure tracing depicting the timing error of late balloon inflation. Early balloon deflation (see image below) leads to submaximal diastolic augmentation and afterload reduction. Delay of balloon deflation to just before the onset of systole will improve the quality of hemodynamic support from counterpulsation. Intra-aortic balloon pressure tracing showing the timing error of early balloon deflation. Late balloon deflation (see image below) leads to LV ejection against increased afterload, raising LV wall stress and myocardial oxygen consumption. Adjustment of deflation to before the onset of systole prevents counterpulsation from becoming counterproductive. Intra-aortic balloon pressure tracing showing the timing error of late balloon deflation. The Benchmark Counterpulsation Outcomes Registry published outcomes data on 16,909 patients undergoing IABP therapy between 1996 and 2000. The total incidence of major complications was 2.6%; incidence of minor complications was 4.2%. Specifically, the incidence of major limb ischemia, defined as loss of pulse, abnormal limb temperature, or pallor requiring surgical intervention, was 0.9%. The incidence of bleeding associated with hemodynamic compromise, requiring transfusion or surgical intervention was 0.8%. In addition to vascular and bleeding complications, IABP may be associated with systemic cholesterol embolization, infection, and stroke. Intra-aortic counterpulsation remains the workhorse circulatory support device used by cardiovascular specialists. The device provides a minimally invasive method of support for failing left ventricular (LV) function by reducing afterload and improving myocardial oxygen supply-demand balance. However, the efficacy of counterpulsation depends on several factors, including intrinsic ventricular function. For this reason, the options of available circulatory support have also expanded to include peripherally inserted ventricular assist devices such as the TandemHeart and Impella device. TandemHeart (CardiacAssist, Pittsburgh, Pa) provides left atrial–to–femoral artery bypass and can be inserted under fluoroscopy in the cardiac catheterization laboratory without surgical implantation. The TandemHeart system uses a transseptal cannula that allows direct unloading of the left heart, and, by providing a cardiac output independent of ventricular stroke volume, this device provides support only exceeded by traditional surgically implanted ventricular assist devices (VAD). An external centrifugal pump provides flow rates up to 4 L/min. In some centers, the venous-to-arterial bypass is interrupted by an oxygenator membrane and the venous cannula is placed in the right atrium. This provides complete pulmonary circulation bypass with an extracorporeal membrane oxygenator configuration (ECMO). In contrast, the Impella device (Abiomed, Danvers, Mass) provides direct unloading of the left ventricle (LV) using an integrated pump and catheter system. A 9F pigtail catheter carries a pump housing of 12F caliber, which pulls blood volume from the LV and ejects it into the ascending aorta. Current devices can provide flow rates up to 2.5 L/min; newer available devices provide up to 3.5 L/min and 5 L/min (5 L requires surgical implantation). It has been used for temporary support in the setting of high-risk percutaneous coronary intervention (PCI) and as a bridge to recovery in acute myocardial infarction. See image below. Impella device positioned in the left ventricle. Blood from the left ventricle is pulled into the inlet area and expelled through the outlet distal to the aortic valve by a motor integrated into the catheter system. Importantly, in comparison to modern intra-aortic balloon pump catheters, the percutaneous VAD systems are high-profile systems. The TandemHeart requires an arterial sheath caliber of 15-17F, and the current generation Impella devices use a 13-14F arterial sheath. However, advances in technology have allowed for development of a lower profile IABP. Initial devices required a surgical cutdown and were up to 15F in diameter, but, in recent years, lower profile devices able to fit through sheaths as small as 7.5F have entered the market. This has reduced vascular complications significantly and allowed for more widespread use of counterpulsation therapy. For this reason, counterpulsation will likely remain the most widely accessible form of mechanical hemodynamic support for the foreseeable future. Moulopoulos SD, Topaz S, Kolff WJ. Diastolic balloon pumping (with carbon dioxide) in the aorta--a mechanical assistance to the failing circulation. Am Heart J. 1962 May. 63:669-75. [Medline]. Antman EM, Hand M, Armstrong PW, et al. 2007 Focused Update of the ACC/AHA 2004 Guidelines for the Management of Patients With ST-Elevation Myocardial Infarction: a report of the American College of Cardiology/American Heart Association Task Force on Practice Guidelines: developed in collaboration With the Canadian Cardiovascular Society endorsed by the American Academy of Family Physicians: 2007 Writing Group to Review New Evidence and Update the ACC/AHA 2004 Guidelines for the Management of Patients With ST-Elevation Myocardial I... Circulation. 2008 Jan 15. 117(2):296-329. [Medline]. Sintek MA, Gdowski M, Lindman BR, et al. Intra-aortic balloon counterpulsation in patients with chronic heart failure and cardiogenic shock: clinical response and predictors of stabilization. J Card Fail. 2015 Nov. 21(11):868-76. [Medline]. Scheidt S, Wilner G, Mueller H, et al. Intra-aortic balloon counterpulsation in cardiogenic shock. Report of a co-operative clinical trial. N Engl J Med. 1973 May 10. 288(19):979-84. [Medline]. Urschel CW, Eber L, Forrester J, Matloff J, Carpenter R, Sonnenblick E. Alteration of mechanical performance of the ventricle by intraaortic balloon counterpulsation. Am J Cardiol. 1970 May. 25(5):546-51. [Medline]. Kern MJ. Intra-aortic balloon counterpulsation. Coronary Artery Disease. 1991. 2(6):649-660. Weber KT, Janicki JS. Intraaortic balloon counterpulsation. A review of physiological principles, clinical results, and device safety. Ann Thorac Surg. 1974 Jun. 17(6):602-36. [Medline]. Kimura A, Toyota E, Lu S, et al. Effects of intraaortic balloon pumping on septal arterial blood flow velocity waveform during severe left main coronary artery stenosis. J Am Coll Cardiol. 1996 Mar 15. 27(4):810-6. [Medline]. Ryan EW, Foster E. Images in cardiovascular medicine. Augmentation of coronary blood flow with intra-aortic balloon pump counter-pulsation. Circulation. 2000 Jul 18. 102(3):364-5. [Medline]. Kern MJ, Aguirre FV, Tatineni S, et al. Enhanced coronary blood flow velocity during intraaortic balloon counterpulsation in critically ill patients. J Am Coll Cardiol. 1993 Feb. 21(2):359-68. [Medline]. Baim DS, ed. Grossman's Cardiac Catheterization, Angiography, and Intervention. 7th ed. Philadelphia: Lippincott Williams & Wilkins; 2006. Sjauw KD, Engstrom AE, Vis MM, et al. A systematic review and meta-analysis of intra-aortic balloon pump therapy in ST-elevation myocardial infarction: should we change the guidelines?. Eur Heart J. 2009 Feb. 30(4):459-68. [Medline]. Kantrowitz A. Experimental augmentation of coronary flow by retardation of the arterial pressure pulse. Surgery. 1953 Oct. 34(4):678-87. [Medline]. Ferguson JJ 3rd, Cohen M, Freedman RJ Jr, et al. The current practice of intra-aortic balloon counterpulsation: results from the Benchmark Registry. J Am Coll Cardiol. 2001 Nov 1. 38(5):1456-62. [Medline]. Hochman JS, Boland J, Sleeper LA, et al. Current spectrum of cardiogenic shock and effect of early revascularization on mortality. Results of an International Registry. SHOCK Registry Investigators. Circulation. 1995 Feb 1. 91(3):873-81. [Medline]. Christenson JT, Simonet F, Badel P, Schmuziger M. Evaluation of preoperative intra-aortic balloon pump support in high risk coronary patients. Eur J Cardiothorac Surg. 1997 Jun. 11(6):1097-103; discussion 1104. [Medline]. Santarpino G, Onorati F, Rubino AS, et al. Preoperative intraaortic balloon pumping improves outcomes for high-risk patients in routine coronary artery bypass graft surgery. Ann Thorac Surg. 2009 Feb. 87(2):481-8. [Medline]. Ozkan U, Oguzkurt L, Tercan F, Kizilkilic O, Koc Z, Koca N. Renal artery origins and variations: angiographic evaluation of 855 consecutive patients. Diagn Interv Radiol. 2006 Dec. 12(4):183-6. [Medline]. Pilarczyk K, Boening A, Jakob H, et al. Preoperative intra-aortic counterpulsation in high-risk patients undergoing cardiac surgery: a meta-analysis of randomized controlled trials†. Eur J Cardiothorac Surg. 2015 Aug 5. [Medline]. Dietl CA, Berkheimer MD, Woods EL, Gilbert CL, Pharr WF, Benoit CH. Efficacy and cost-effectiveness of preoperative IABP in patients with ejection fraction of 0.25 or less. Ann Thorac Surg. 1996 Aug. 62(2):401-8; discussion 408-9. [Medline]. Patel MR, Smalling RW, Thiele H, et al. Intra-aortic balloon counterpulsation and infarct size in patients with acute anterior myocardial infarction without shock: the CRISP AMI randomized trial. JAMA. 2011 Sep 28. 306(12):1329-37. [Medline]. Perera D, Stables R, Thomas M, et al. Elective intra-aortic balloon counterpulsation during high-risk percutaneous coronary intervention: a randomized controlled trial. JAMA. 2010 Aug 25. 304(8):867-74. [Medline]. McBride LR, Miller LW, Naunheim KS, Pennington DG. Axillary artery insertion of an intraaortic balloon pump. Ann Thorac Surg. 1989 Dec. 48(6):874-5. [Medline]. Anderson RD, Ohman EM, Holmes DR Jr, et al. Use of intraaortic balloon counterpulsation in patients presenting with cardiogenic shock: observations from the GUSTO-I Study. Global Utilization of Streptokinase and TPA for Occluded Coronary Arteries. J Am Coll Cardiol. 1997 Sep. 30(3):708-15. [Medline]. Barron HV, Every NR, Parsons LS, et al. The use of intra-aortic balloon counterpulsation in patients with cardiogenic shock complicating acute myocardial infarction: data from the National Registry of Myocardial Infarction 2. Am Heart J. 2001 Jun. 141(6):933-9. [Medline]. O'Neill WW, Kleiman NS, Moses J, et al. A prospective, randomized clinical trial of hemodynamic support with Impella 2.5 versus intra-aortic balloon pump in patients undergoing high-risk percutaneous coronary intervention: the PROTECT II study. Circulation. 2012 Oct 2. 126(14):1717-27. [Medline]. Disclosure: Serve(d) as a director, officer, partner, employee, advisor, consultant or trustee for: ABIOMED, Inc.